Für Hollowbody- und Akustikgitarren wurde dieses Multikern-Kabel ausgelegt. Ein aufwendiges Kupfergeflecht schirmt das Signal sorgsam von Störungen ab. 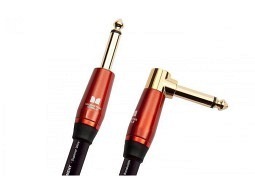 Monster Acoustic Pro Audio is a high-performance, acoustic-specific instrument cable designed for rich, accurate reproduction without frequency and phase distortions. Patented Time Correct windings reject interference, and MicroFiber dielectric enables fast transients and incredible warmth. Monster set the standard with the Original Lifetime Cable Warranty. Monster Acoustic Pro Audio instrument cable is covered by our 100% replacement guarantee so you'll be a Monster for Life!